Healthy living requires regular tracking of blood pressure and glucose level. Today’s lifestyle has made enormous changes in the healthy living of people. This lifestyle change has brought many diseases into our lives. Such diseases include diabetes and hypertension. The average number of people suffering from this disease has increased manifolds. Additionally, the age in which these diseases used to occur in the past has also been reduced. There are a number of factors that are responsible for this shift. These health conditions require a person to keep a close watch on their blood pressure as well as their body’s glucose level. For this purpose, various gadgets are available that help you check your systems and note down readings on a blood pressure and glucose tracker document. This is a simple chart that requires the user to enter the readings of blood pressure and glucose taken at regular intervals of time. The tracker also allows the user to input regular values for blood pressure and glucose levels throughout the day and see a visual pattern of the rise or fall of the various readings. All you need to do is enter the numbers along with the day and time and your charts will appear. There is also space to make notes and write down any specific directions or instructions to help understand trends in the readings. Many people in the world today suffer from various types of blood pressure disorders. Blood pressure itself is a problem and there are many other allied diseases that are caused by this prolonged human body disorder. For this purpose, many a time’s doctors need to record the blood pressure readings of the patients to have an insight into his/her medical condition. This can be done through the blood pressure tracker template. It is a very effective and useful chart that helps to record each and every blood pressure reading of the patient. The users can enter the readings at regular intervals and use it as a monitoring tool for the treatment of patients. 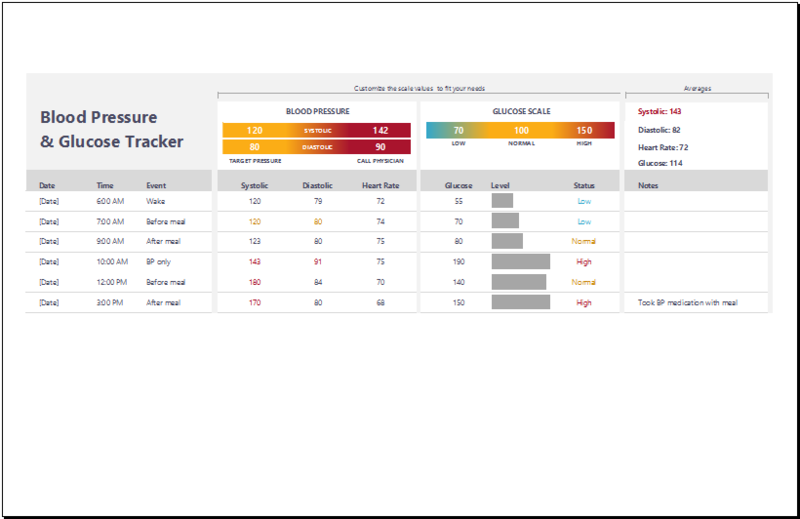 The BP tracker template is simple and convenient and helps in the maintenance of patient’s history and past records as well. Many times this chart also contains other valuable information like the pulse rate, heartbeat, medicines given along with their dosage and other related data and information. In most cases, these documents are maintained by the nursing staff of a hospital or clinic. Here are given few templates that will help you in tracking blood pressure either you make use of it at home, clinic or hospital.